My Christmas was gluten-free. Every year, the holiday season leaves me feeling bloated from feasting on the holiday specials (and completely giving up festive food is neither possible nor probable). So this time, I tried to retain the quintessential flavours of the season by choosing lighter (and healthier) substitutes for ingredients that leave one feeling full and sluggish. I’m not normally on a 100% gluten-free diet the rest of the year, but yes, when there are parties to attend and dresses to fit into, it makes sense to turn into a gluten-free gourmand. When early mornings get ever-so-slightly nippy even in the warm tropical weather of my city, I know there has to be something sweet, smelling of cinnamon, cloves and nutmeg in my oven. It must have a rich, moist crumb, be deliciously dark in colour and filled with all manner of fruit. This year, cupcakes scored over cakes. My Christmas cupcakes would be gluten-free, spiced and loaded with fresh and dried fruit and nuts. With guests dropping by almost everyday, I made a large batch to serve with glasses of mulled wine. The cupcakes would be perfect little mouthfuls of Christmas. Since I wanted the cupcakes to look dark and luxuriant, buckwheat flour seemed like a good choice. Strictly speaking, buckwheat is not a grain, rather it is the seed of the buckwheat fruit. The plant itself belongs to the rhubarb and sorrel family unlike grain plants which are part of the grass family. Long thought to be extremely beneficial to health, buckwheat flour is a great, nutrition-packed and fibre-rich option to gluten containing flours. Here in India, it’s eaten by Hindus during fasts when grains such as rice and wheat are forbidden. Know as kuttu ka atta, it is very popular in northern and western India. 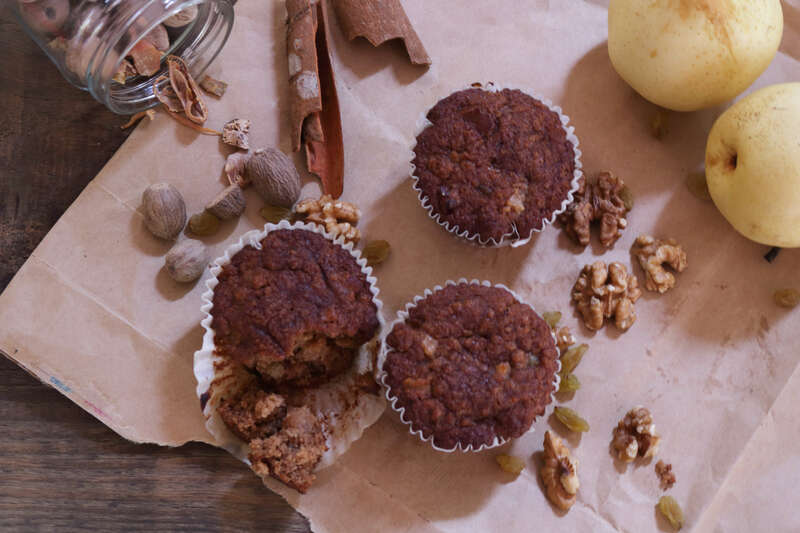 In addition to buckwheat flour, I thought oat flour with its sticky texture and binding properties would hold together the generous heaping of fruit and nuts in the cupcake. Equal quantities of both flours worked wonderfully to produce a dense yet light, gluten-free, cupcake. If I did not have a surfeit of Asian pears in my fridge, I would’ve gone for apples but both fruits work well in this recipe. 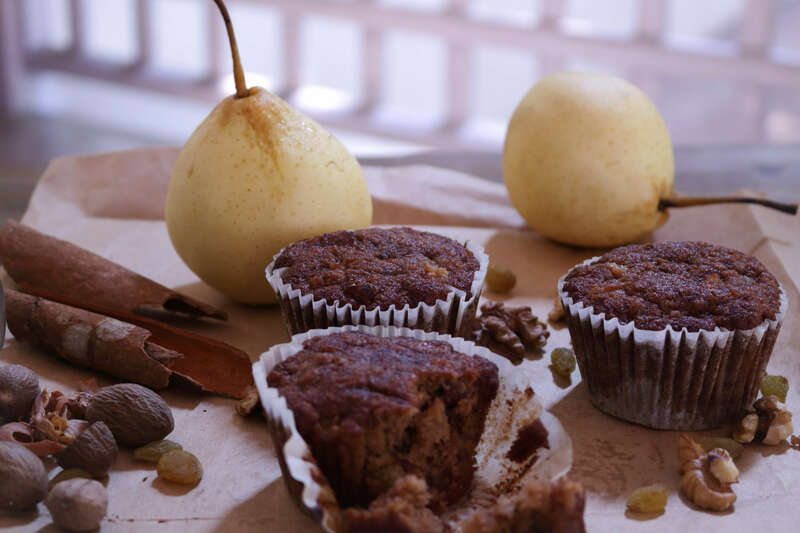 Pears are crunchy but when cooked, they add fruity moistness to the cupcake. It is better to add cooked and cooled pears to the batter rather than uncooked chunks of fruit because they have high water content, which must be reduced by cooking. Otherwise, the gush of juices released during baking will make the cupcakes soggy. I gently sauteed the pears along with the nuts and raisins a tiny dollop of butter for a few minutes with a generous dusting of cinnamon and nutmeg and molten ribbons of honey. 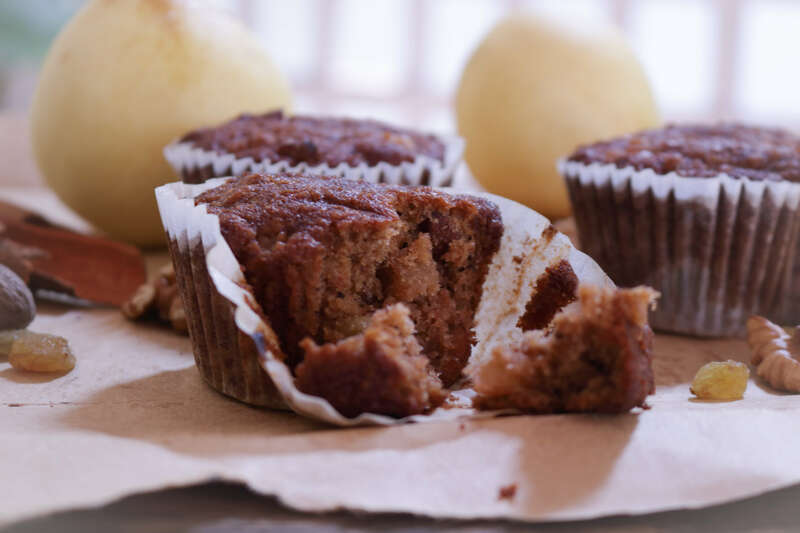 While the nuts get a coat of syrupy glaze, the pears and raisins become soft and yielding; it’s a beautiful contrast of textures that makes every bite of the cupcake delightfully different. Simple, quick and healthy, they can be baked in large batches to last you through the holidays (although I doubt they will). Light and scrumptious, they disappear pretty fast. I did not dress or decorate them, preferring to keep their toasty wholesomeness unmasked by any other flavour. If you’d like to jazz them up for a celebration, dust them with snowy castor sugar, drape with a dark chocolate ganache or crown with an airy swirl of vanilla butter cream. Honestly, even if it isn’t the festive season, buckwheat, oats, almonds, walnuts, raisins, eggs and pears, are all the ingredients I need for a power- packed, gluten-free, breakfast, a snack-in-my-bag or a something sweet with my tea. These cupcakes are healthy and handy to have at home, so I’m thinking of baking them throughout the year. Many ‘healthy’ recipes turn out to be elaborate, tedious and fad-driven and eventually even disappoint the palate. Happily, this isn’t one of them. Wholesome and organic in its composition, it is a recipe you want to have in your recipe box. 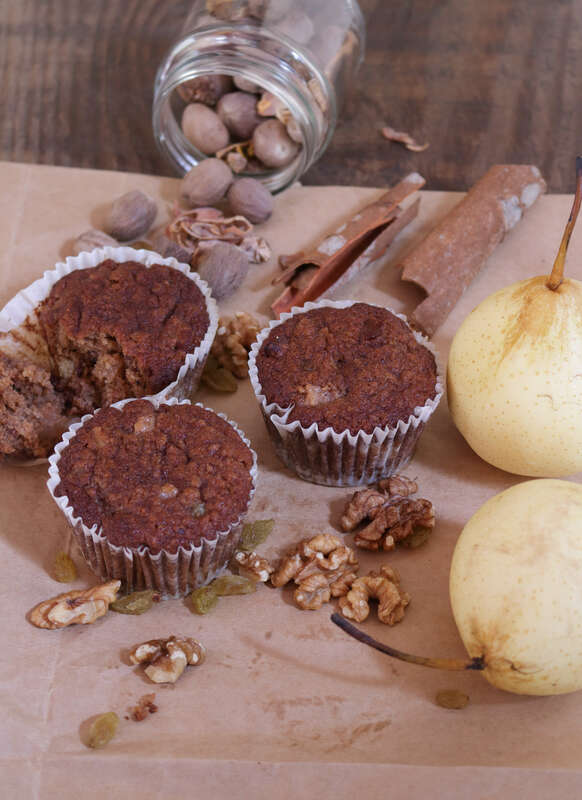 Cinnamon-scented, gluten-free cupcakes packed with walnuts, pears, almonds and raisins. Preheat the oven to 175 degrees C. Grease 12 cupcake molds and line with paper liners. Heat 1 tbsp butter in a pan and toss in the diced pears. Cook for 3-4 minutes, add the raisins and the nuts and then pour in the honey. Cook on low heat for 5 minutes. Sprinkle the cinnamon and nutmeg and cook further for 1-2 minutes till the mixture is thoroughly coated with syrupy honey and spices and all the water from the pears has dried up. Set aside to cool. In a bowl, combine the flours with salt and soda bicarbonate. In a larger bowl, cream the butter and brown sugar. Add the vanilla extract and eggs and beat further till light and frothy. Using a spatula, gently fold in the flour mixture until just combined. Take care not to overmix. Finally, mix in the cooked fruits and nuts. Add the milk to loosen the batter a little if it appears too thick. Spoon the cake batter evenly into the prepared molds and bake for 20 minutes or until a skewer inserted into the cupcakes comes out clean. Cool the cupcakes on a wire rack and store in an airtight box.